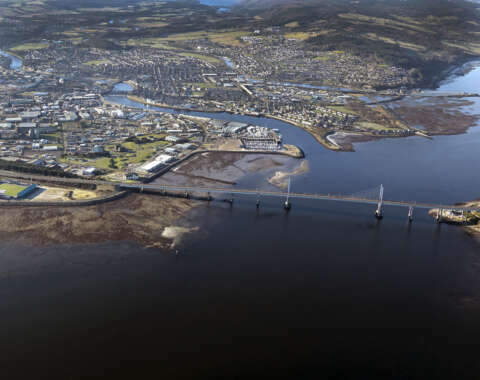 The Port of Inverness is one of the major economic hubs of the Highlands and provides a vital gateway for companies in the north both to export and import a wide variety of goods. It is also one of Scotland’s most sheltered natural deep water harbours and as a result the port can offer ships almost guaranteed access irrespective of the weather. 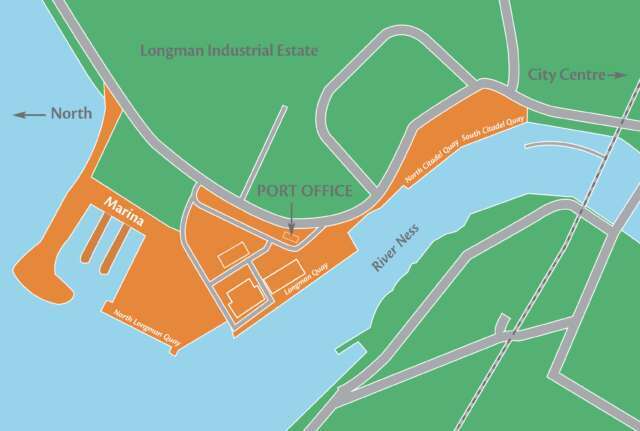 The port lies close to the city centre and thus has excellent communications links not only with the city but the surrounding wider region. Recent developments have made the port one of the most modern in the north with excellent covered storage and laydown facilities. The North Longman Quay, completed in 2009, is the main quay geared toward the energy and renewables industries. It formed part of the wider North Longman Development that reclaimed approximately 10 hectares of land. Over the last few years the port has handled turbine machinery for a number of projects including the Corrimony, Rothes II, Berryburn and Clashindarroch wind farms. More recently equipment for Moy, Dunmaglass, Corriegarth, Edintore, Hill of Glaschye and Bhlaraidh wind farms has passed through the port. The quay also has a heavy lift pad that can take lifts of up to 200 tonnes though through a variety of engineering solutions, this weight can be increased. The heavy lift pad has been used recently for one off project cargo lifts. An additional benefit with this quay is the extensive area of quayside laydown space that is available. Up to 15,000 sq. m can be made available for cargoes immediately adjacent to this quay with additional laydown areas available elsewhere within the port. As part of the North Longman Development, a new entrance was created and the bell mouth entrance can accommodate loads of up to 57m in length. Plans are being formulated for further expansion on land owned by the port out towards the Kessock Bridge and beyond. These proposals will allow for further expansion of the port and create a major economic hub with extensive water frontage.